"This suggests a simple 'monolithic collapse' model of Milky Way evolution, where hydrogen for star formation gradually migrated from a spherical shape to its current flattened disk shape. This model is perhaps too simple." "I think it is mindblowing that we are able to see (with the naked eye) light that is over 2.5 million years old. Literally like a time machine that see things we can't touch, but just admire. It makes me feel really small and insignificant in the expanse of our universe." "One light year is crazy to me, let alone how far away everything is based on light years. It's mind-blowing." "The thought that telescopes are technically time machines is really abstract." "That at the start of the universe was primarily hydrogen interesting because that is how the all of the stars started to form." "Learning about how the universe is expanding. Also how scientists used this information to look into the past to find out how old the universe is." "I found the 'edge of time' to be interesting. The thought of the universe having a finite age isn't something I thought of before. We always want to think of something having an end, but the universe is expanding." "That all galaxies are fleeing away from the Milky Way." "That the big bang occurred everywhere; before I assumed it happened in a specific location." "The part concerning the infinity of space really interests me it always has. Is there and end to it all? If there is whats beyond the end of space? It really gets me." "Lookback time was confusing at first, but having the concept of light years explained cleared this up." 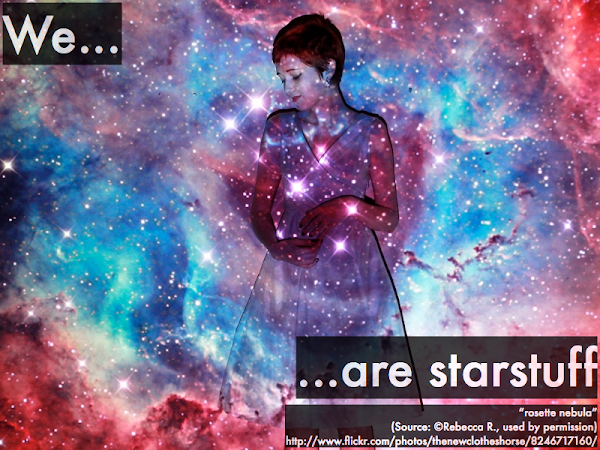 "Understanding which stars have more or less metals then others." "Metal-rich versus metal-poor stars and how this relates to their location in the galaxy." "Need some review over what produces a specific kind of element. I couldn't find it within the blog lecture, but I'm sure it's there. Just need some further review." "How the stars and later type II supernovas created metals in its core if it didn't have any metals to start out with." "The difference between population I stars and population II stars? What confuses me is how the ages of population I stars can be older than population II stars?" "I find it confusing to understand how the universe is expanding everywhere. What is causing this?" "Wow is there an 'edge of time.' and what is beyond that?" "I am confused if we can only see 14 billion light years away as that is what they predict how old our universe is." "How can astronomers and other scientist say the Universe and all of the things within it are a certain age? The textbook states, the ages of particular parts of the universe are 'somewhat uncertain,' but scientist still claim their theories are correct without any real, provable evidence." "Look-back time is absolutely insane. How are we seeing Deneb as it was 1,400 if we are looking in the present? Or Andromeda, how are we seeing the stars from millions of years ago? I'm so confused? HELP P-DOG!" "I was a little confused with where the elements were produced." "Please explain the relationship between population I and II type stars." "Why is the universe expanding?" "This reading covers transfers of heat. Convection, where heat is transferred by the movement of a fluid. Conduction, where heat is transferred through a material directly. 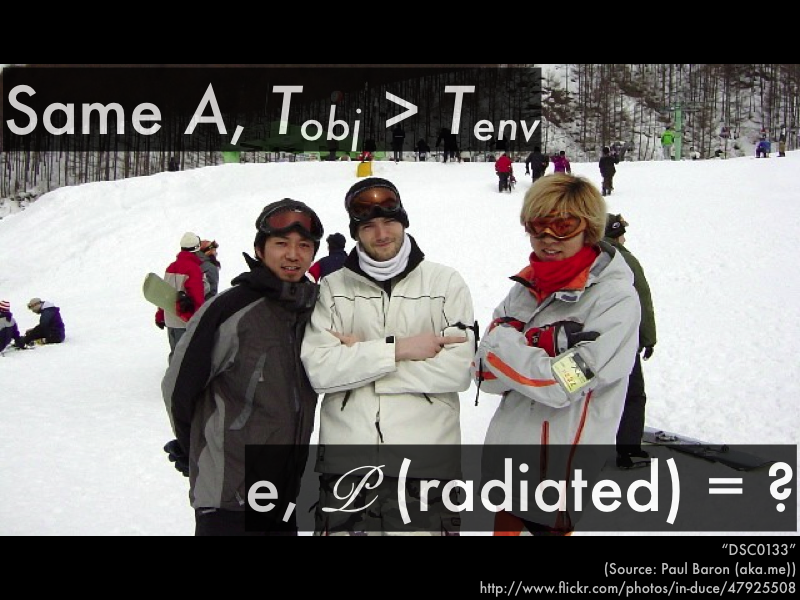 Radiation, where heat is traveled through electromagnetic waves and a look into their applications." "I learned that conduction is heat transferred through solid objects, convection through fluids, and radiation in the form of light. I also learned that power is measured as the amount of energy transferred per time." "Fourier's law of conduction seems sort of alright. Power is proportional to the temperature difference ∆T and inversely proportional to thermal resistance R, which itself is proportional to thickness of the material, and inversely proportional to its resistivity and area." 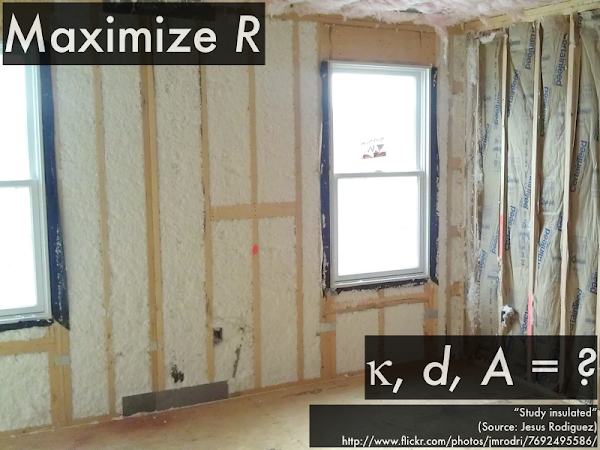 "By increasing the thickness or decreasing the Area of an a wall (material), you decrease heat flow. Heat is conducted based on the modules bouncing around (molecular energy). Metals have more free electrons, which increases this bobbling around (increasing heat conduction). I get that Q is inversely proportional to thickness/length. Also, radiation doesn't require a material medium." "How different colors (or materials) like the blackbody and the silverbody both absorb and radiate heat differently." "I understand how to apply Fourier's and Stefan's law to real life scenarios, but not mathematically." "I wouldn't say I understand this chapter completely. I'm hoping class will resolve this feeling." "I have never been exposed to the equations that are involved with the different heat exchanges, so of course they will begin to make more sense once I start using them more." "In particular I don't fully understand thermal resistance." "I think some of the equations used for each concept might be a bit confusing for me. Other than that I think learning it in class will reinforce the idea." 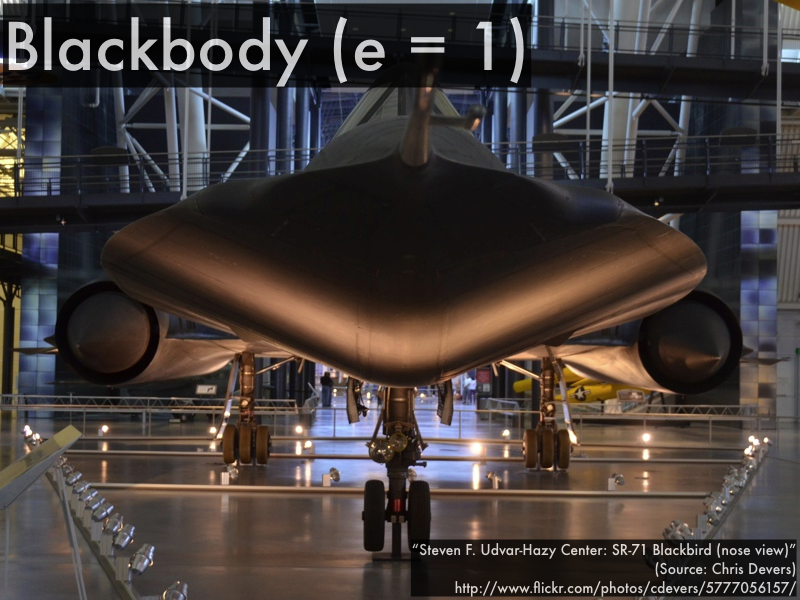 "Blackbody, silverbody, and radiation were confusing, but now I am fine." "Kind of confused by radiation. I thought black things heated up fast...but I didn't know they loose heat fast too? Also I think it would be good to see a Stefan's law problem worked out, there's a lot of symbols in there." "I didn't quite understand Stefan's law and would greatly benefit from an overview of it in lecture." "I understood all of the concepts in this section." "How about more examples of blackbody and silverbody applicable to global warming and the similarities and differences to the albedo effect?" "Interesting presentation today, I enjoyed it!" "I found the topic of when the universe and how it began very interesting; I like reading about the theories and wonder if they are 100% accurate." "How we can look back into time in a certain manner of speaking by observing the stars light that is coming from light years away. The fact that we are not seeing the object as it is but as it was from the amount of light years it takes to get here." "Light is like time travel but not. Light from other areas may not currently exist today but it did years ago." "How old our galaxy is, and how they could determine this was interesting because it's such a large span of time that is really hard to imagine." "The early universe started out with basically just only hydrogen, and the first-generation massive stars then gathered this hydrogen and promptly got to work." "That elements humans are made out of came from stars. I never realized were that closely connected to space." "The iron, carbon, and calcium in us is as old as like everything." "What I found cool was that the universe keeps expanding; I thought it was interesting because it makes me question about other life forms." "How metals have formed over time." "The origins of elements in the universe." "Olbers' question about the edge of the universe." "How from the big bang planets and suns and galaxies formed." "'Big bang'--I'm unclear as to what is being referred to exactly: if it's a process, or how it works overall." "The Hubble law--I did not quite understand it and would like further explanation on it." "Most of this reading I found confusing, didn't really understand or knew where to find the answers :("
The following questions were asked on reading textbook chapters and previewing a presentation on internal energy conservation. "I understand heat and internal energy and that heat tends to flow from a hotter temperature object to a lower temperature object." "If something's thermal energy increases, the temperature increases. If the thermal energy decreases, the temperature decreases." "I understood a lot because I learned this in chemistry. Heat always flows from high to low, if the environment has no effect then each energy term must directly mirror the other..."
"If the thermal energy of a system is increasing (heating), that means external heat is positive and is adding into the system. If it's decreasing (cooling), external heat is negative and it's removing from the system. Zero means no energy is being transferred in or out of the thermal internal energy system." 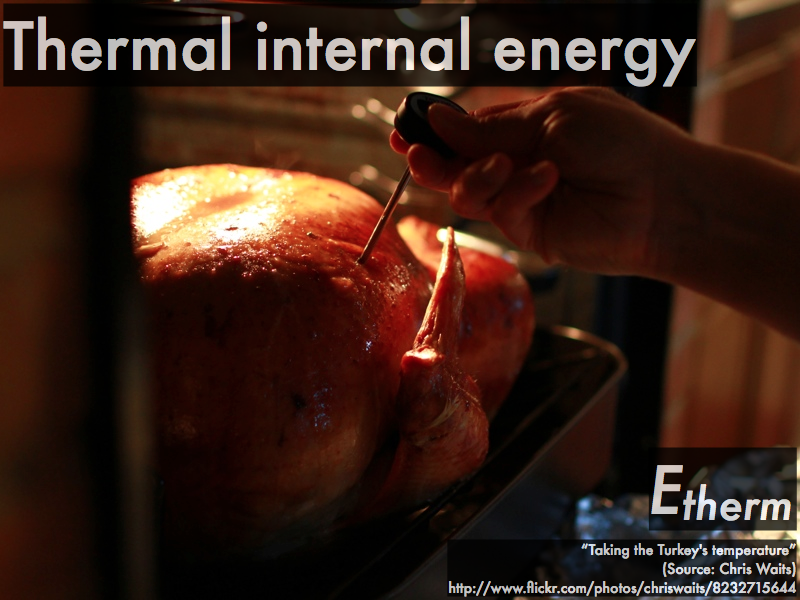 "Thermal internal energy depends on temperature. It makes sense that a low temperature object has low thermal internal energy, and a higher temperature indicates higher thermal internal energy. Energy not transferred in/out of the thermal internal energy of a system is isolated from the environment and heat exchange between the system and the external environment is zero." "Thermal energy is transmittable between objects in the form of heat. Temperature changes are a direct result transferences of proportionate amounts of thermal energy. It is also worth noting that different materials are able to retain and transfer thermal energy very differently." "I understand that when we look at thermal internal energy we are more focused on the change in temperature of an object or objects. Everything has its own specific heat capacity similar to last chapter when we were talking about the Young's modulus. Heat is added to a system or taken away from a system and that energy is conserved in thermally isolated areas. However, perfect thermally isolated areas do not appear often in the natural environment but we can create those in things like a thermos (still not perfect)." "I don't understand how internal energy and temperature relate to each other." "I understand the heat and energy concepts. I am confused about using the equations. I will pay attention in class and keep on visiting the tutors." "New symbols/terms for these things are going to take some getting used to." "Simple concepts in this reading. Not too much that is confusing." "Nothing too confusing from this reading thus far." Raw seafood is placed on a block of salt that has already been heated up. The energy contained in the high-temperature block of salt is then transferred to the seafood, cooking it. 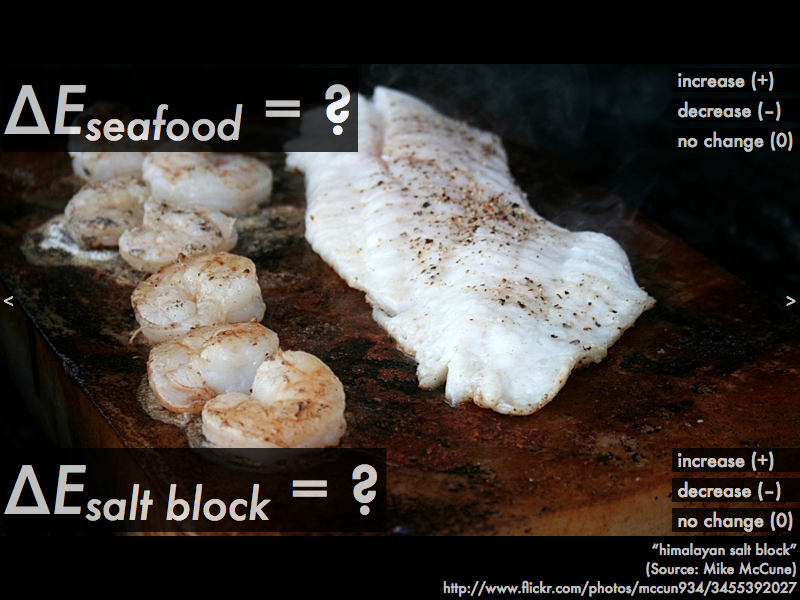 While it is being cooked, the internal thermal energy of the seafood __________, while the thermal internal energy of the salt block __________. Frozen meat is placed in a water bath, in order to defrost it. 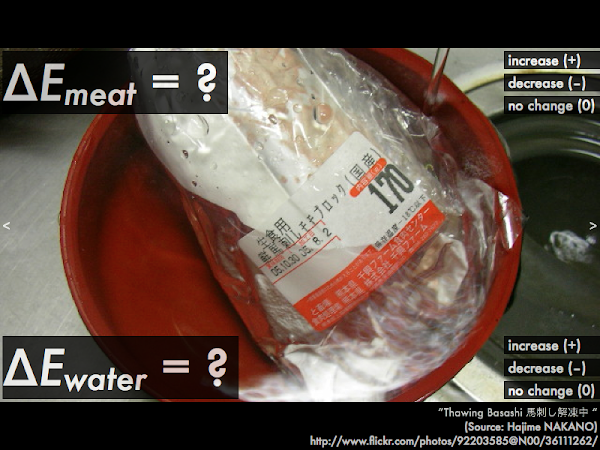 At the very start of this defrosting process (where the frozen meat just begins to warm up from its below-freezing temperature, and the ice crystals inside have not yet reached the melting point), the internal thermal energy of the meat __________, while the thermal internal energy of the water __________. A shot of whiskey is mixed with a pint of beer to make a boilermaker. 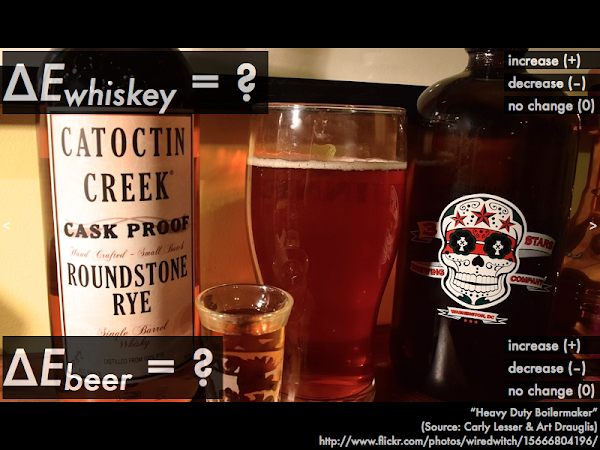 Assuming that the whiskey and beer have approximately the same temperature before they are mixed together, the internal thermal energy of the whiskey __________, while the thermal internal energy of the beer __________. "Thermal energy transfers happen all around us everyday!" Astronomy midterm question: possible IAU classification of "rounded" 2006 RH120? In the (unlikely) event that 2006 RH120 is found to have a rounded shape, discuss how it should be classified when it is in its usual orbit around the sun. Explain using the International Astronomical Union classification scheme. 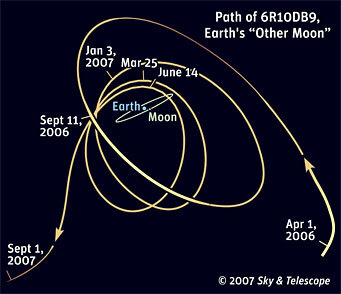 [**] Illustration credit: Gregg Dinderman, skyandtelescope.com/astronomy-news/earths-other-moon/. Correct. Discusses IAU classification scheme to argue that 2006 RH120 when in its usual orbit around the sun would pass qualification I (orbits the sun directly), and with a presumably (however unlikely) rounded shape would pass qualification II (rounded shape), but as it is periodically captured by Earth's gravity 2006 RH120 does not dominate its orbit, and thus would presumably be classified as a dwarf planet. Contains right ideas, but discussion is unclear/incomplete or contains major errors. Explicitly lists IAU requirements, but does not apply them correctly/consistently. Limited relevant discussion of supporting evidence of at least some merit, but in an inconsistent or unclear manner. Discussion only tangentially related to the IAU classification scheme. Implementation/application of ideas, but credit given for effort rather than merit. Discussion unrelated to the IAU classification scheme. Laur: If two stars have the same apparent magnitude but different absolute magnitudes, what can you say about their distances? arsl: The star with the dimmer absolute magnitude is closer. Discuss whether this answer is correct or incorrect, and how you know this. Explain using the relationships between apparent magnitude, absolute magnitude, and distance. either compares two stars closer than 10 parsecs away, or two stars farther than 10 parsecs away, or one star closer and one star farther than 10 parsecs away to show that the "star with the dimmer absolute magnitude is closer" compared to a star with a brighter absolute magnitude that is farther away. Contains right ideas, but discussion is unclear/incomplete or contains major errors. At least discussion demonstrates understanding of relationships between apparent magnitudes, absolute magnitudes, and distances. Limited relevant discussion of supporting evidence of at least some merit, but in an inconsistent or unclear manner. At least attempts to use relationships between apparent magnitudes, absolute magnitudes, and distances. Implementation/application of ideas, but credit given for effort rather than merit. 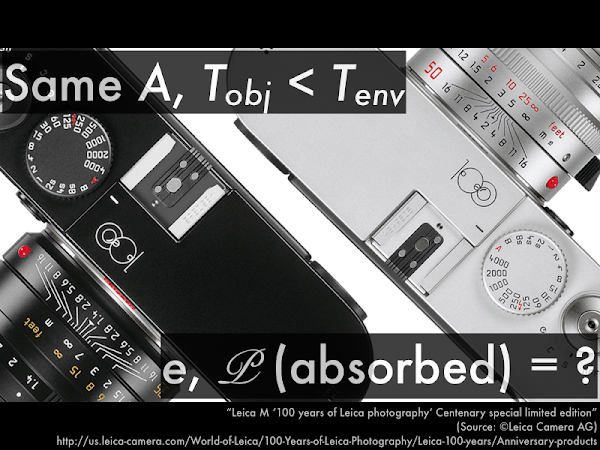 Discussion based on garbled definitions of, or not based on proper relationships between apparent magnitudes, absolute magnitudes, and distances. Astronomy midterm question: supergiant smaller than giant? 2416: If one were to find a supergiant with brighter luminosity and hotter temperature than a giant, it could indeed be smaller than the giant. Discuss whether this claim is correct or incorrect, and how you know this. Explain using Wien's law, the Stefan-Boltzmann law and/or an H-R diagram. Correct. Discusses how the H-R diagram and/or the Stefan-Boltzmann law (luminosity is proportional to size × Temperature4) demonstrates that a more luminosity and hotter supergiant could be smaller than a less luminous and cooler giant. Contains right ideas, but discussion is unclear/incomplete or contains major errors. Typically argues how a more luminous and hotter supergiant cannot be smaller than a less luminous and cooler giant, as the supergiant must be the same size and/or larger than the giant. Limited relevant discussion of supporting evidence of at least some merit, but in an inconsistent or unclear manner. At least attempts to use Wien's law, the Stefan-Boltzmann law, and/or H-R diagram. Implementation/application of ideas, but credit given for effort rather than merit. Discussion not clearly based on Wien's law, the Stefan-Boltzmann law, and/or H-R diagram. A basketball (mass 0.43 kg, radius 0.11 m) and a tennis ball (mass 0.058 kg, radius 0.033 m) both roll without slipping across a horizontal floor with the same constant speed of 0.50 m/s. Discuss why the basketball will have more rotational kinetic energy than the tennis ball. Both objects are hollow spheres (I = (2/3)·M·R2). Correct. Numerically calculates for each ball the angular speed from the v = R⋅ω condition for rolling without slipping, and moment of inertia I = (2/3)·M·R2, and then includes both these factors to compare the rotational kinetic energy KErot = (1/2)⋅M⋅ω^2 of both objects, such that the basketball has a larger numerical value for the rotational kinetic energy than the tennis ball. Nearly correct, but argument has conceptual errors, or is incomplete. 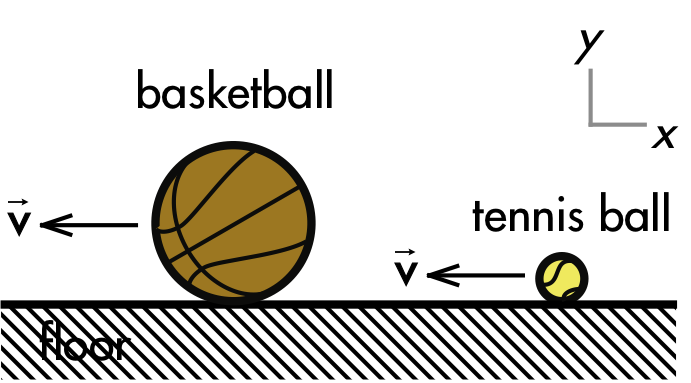 At least shows that the basketball has a higher moment of inertia than the tennis ball, but claims that they have the same angular speed, or does not explicitly show that difference in angular speeds is much smaller than the difference in moments of inertia in determining that the basketball has a greater rotational kinetic energy. A horizontal force is applied to hold a uniform beam stationary at an angle of 80° above the horizontal, and another horizontal force is applied to hold it stationary at an angle of 10° above the horizontal. (Calculate all torques with respect to the pivot, located at the base of the beam.) Discuss why less force required to hold the beam when it is at the higher 80° angle. Explain your reasoning using diagram(s) with locations of forces and perpendicular lever arms, the properties of torques, and Newton's laws. for the higher beam, the shorter ℓw in the numerator and longer ℓF in the denominator means that the applied force F is smaller than for the lower beam (where it has a longer ℓw in the numerator and a shorter ℓF in the denominator). As (p), but argument indirectly, weakly, or only by definition supports the statement to be proven, or has minor inconsistencies or loopholes. At least demonstrates that for the higher beam ℓw is shorter and ℓF is longer, but typically discusses only how one of these contributes to making the applied force smaller. Nearly correct, but argument has conceptual errors, or is incomplete. 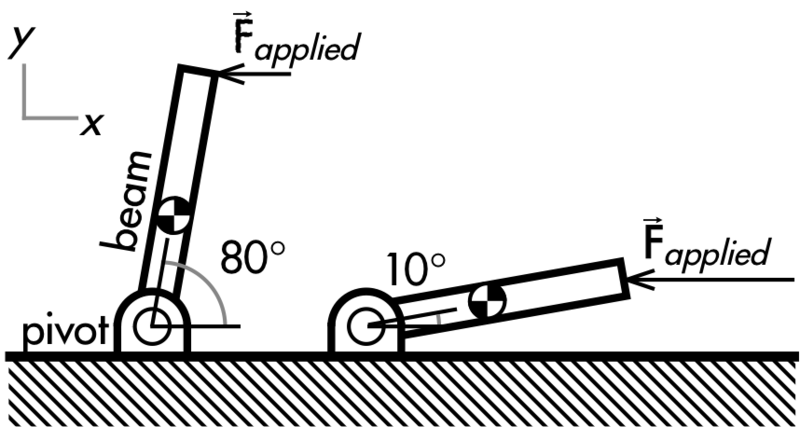 Typically argues that F is smaller for the higher beam because ℓF is larger (while claiming ℓw is the same for both beams); or F is smaller for the higher beam because ℓw is smaller (while claiming ℓF is the same for both beams). Limited relevant discussion of supporting evidence of at least some merit, but in an inconsistent or unclear manner. Some garbled attempt at applying Newton's first law to torques, forces, and perpendicular lever arms. Implementation of ideas, but credit given for effort rather than merit. Approach other than that of applying Newton's first law to torques, forces, and perpendicular lever arms. A wooden cube is made by gluing ebony (denser) and balsa (less dense) pieces together. Both pieces have the same volume. The total density of the cube is less than that of water. The cube is carefully placed into water such that it floats "top-heavy" (ebony on top of balsa). 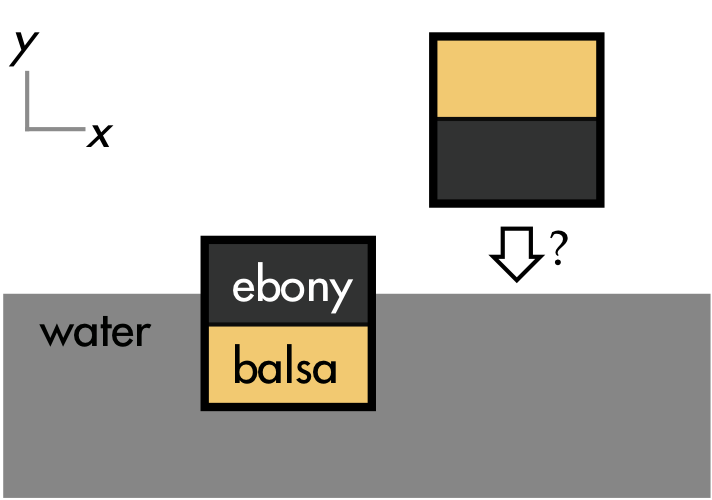 The cube is then turned over such that it floats "bottom-heavy" (balsa on top of ebony). Discuss which orientation will float higher (or if there is tie), and why. (Ignore any water that may soak into the wood pieces, and the thin layer of glue between the two wood pieces.) Explain your reasoning using the properties of densities, volumes, forces, Newton's laws, Archimedes' principle (buoyant forces), and free-body diagrams. 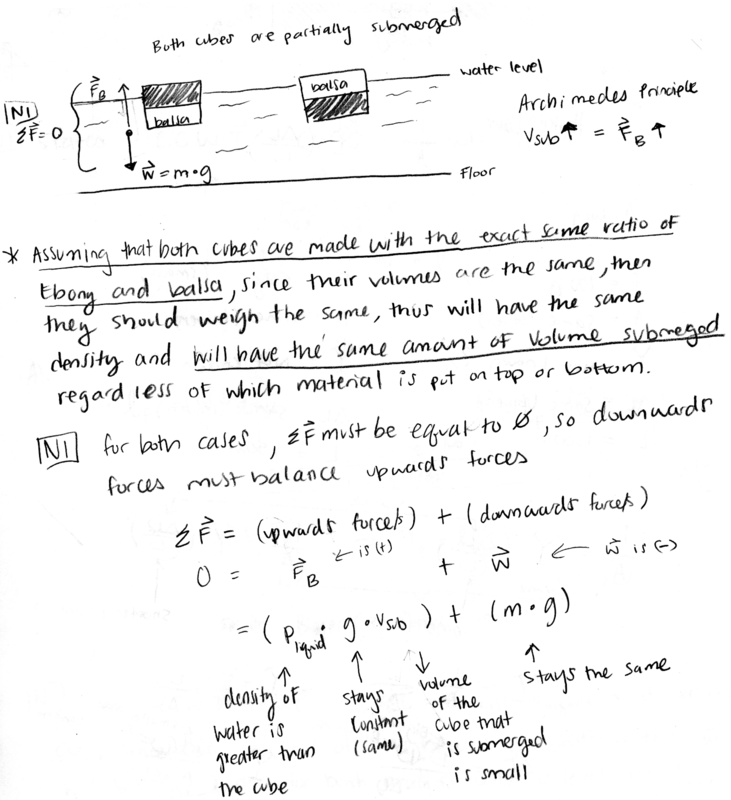 the amount submerged volume underwater for both blocks must be the same. Thus the buoyant forces on each block ("bottom-heavy" or "top-heavy") are equal, and thus the amount of volume submerged for either block must be the same. As (p), but argument indirectly, weakly, or only by definition supports the statement to be proven, or has minor inconsistencies or loopholes. May somehow claim that the cube will float differently when "bottom-heavy" or "top-heavy", or does not explicitly conclude that the cube will float at the same water level whether "bottom-heavy" or "top-heavy." Nearly correct, but argument has conceptual errors, or is incomplete. 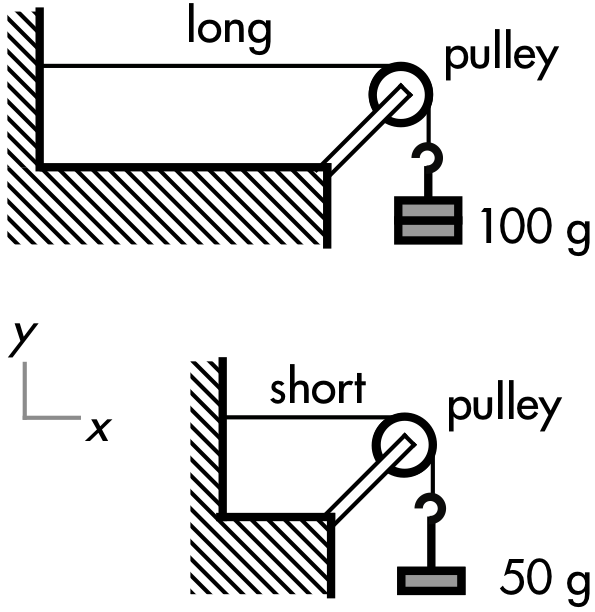 At least recognizes that the weight force on the block is unchanged whether "bottom-heavy" or "top-heavy," but somehow has different buoyant forces acting (thus Newton's first law would not apply to at least one of the blocks); or has different weights and different buoyant forces acting on the blocks, but for each block these forces are balanced via Newton's first law. imited relevant discussion of supporting evidence of at least some merit, but in an inconsistent or unclear manner. Some constructive attempt at relating the buoyant force to the density of the fluid and volume displaced (Archimedes' principle) and/or Newton's first law. Implementation/application of ideas, but credit given for effort rather than merit. Appeals to some other properties of fluids and densities other than Archimedes' principle and Newton's laws. 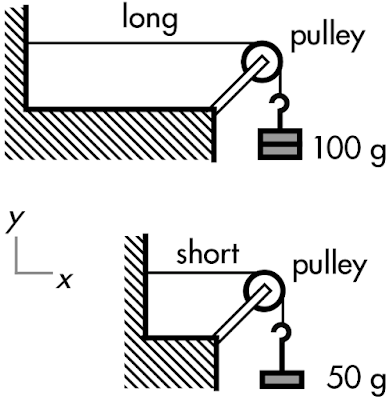 A long 1.00 m fishing line and a short 0.50 m fishing line (same cross-sectional area) are each strung horizontally over a pulley, and are attached to a 100 g mass and a 50 g mass, respectively. As a result both fishing lines stretch the same amount from their original lengths. It is not known if these fishing lines are made of the same material. Discuss which material has the greater Young's modulus value (or if there is a tie), and why. Explain your reasoning using the properties of stress, strain, and Hooke's law. since Young's modulus Y = (F⋅L)/(A⋅ΔL), the longer L fishing line with the greater tension force F will have a larger Young's modulus (specifically four times larger) than the shorter fishing line with the lesser tension force. As (p), but argument indirectly, weakly, or only by definition supports the statement to be proven, or has minor inconsistencies or loopholes. Typically has clerical errors (mislabeling "long" versus "short" labels), and so concludes that Young's modulus must be the same for both fishing lines. Nearly correct, but argument has conceptual errors, or is incomplete. Typically only recognizes length L or tension force F has having an affect on Young's modulus Y; or has recognizes both quantities as having an affect on Y, but someone argues that these cancel each other out, such that the fishing lines have the same Y value. Limited relevant discussion of supporting evidence of at least some merit, but in an inconsistent or unclear manner. At least some systematic attempt at using Hooke's law quantities. At least some systematic attempt at using Hooke's law quantities. Implementation/application of ideas, but credit given for effort rather than merit. Approach other than that of relating strain (force per unit area), Young's modulus, and strain using Hooke's law. 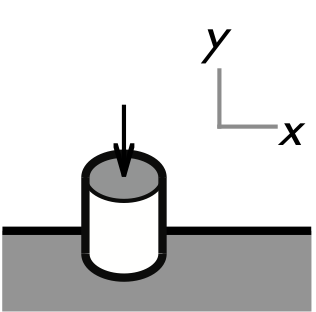 A 0.90 kg cart traveling in the +x direction at 0.45 m/s collides with a 0.15 kg cart that is initially at rest. The carts are not stuck together after the collision. After the collision, the 0.90 kg cart continues traveling in the +x direction at 0.35 m/s. Ignore friction, drag and other external forces during this brief collision. Find (a) the final velocity of the 0.15 kg cart, and (b) classify this collision as elastic, inelastic, or completely inelastic. Show your work and explain your reasoning using properties of collisions, energy (non-)conservation, and momentum conservation. Correct. Finds final speed vf2 = +0.60 m/s of the 0.15 kg cart, using conservation of momentum (as there is negligible drag/friction for this brief collision). It is not known whether the carts are permanently deformed and/or energy was lost to thermal/sound systems, so collision could be either inelastic or elastic (but cannot be completely inelastic because the carts are not stuck together after the collision). Explicitly tests for whether or not translational kinetic energy is conserved, and finds that since it is not conserved, this collision must be inelastic. Nearly correct, but approach has conceptual errors, and/or major/compounded math errors. Has correct vf2 from momentum conservation, and at least some attempt at testing for translational kinetic energy conservation. Implementation of right ideas, but in an inconsistent, incomplete, or unorganized manner. 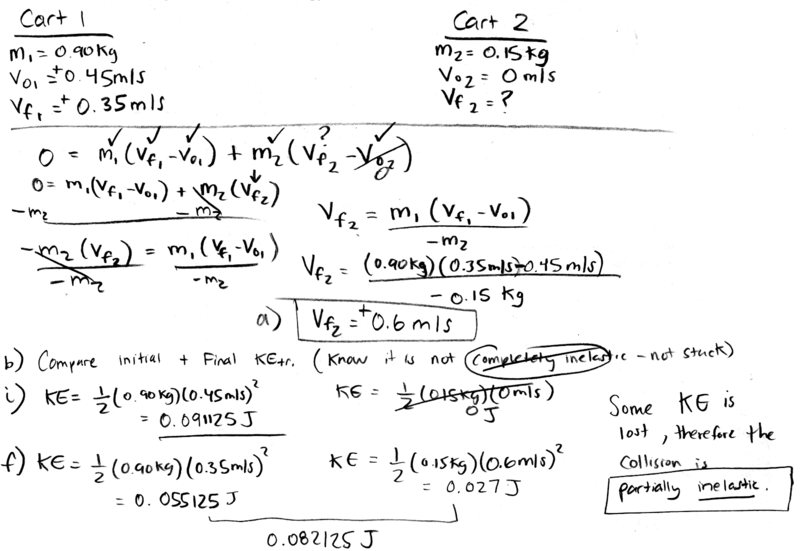 Application of momentum conservation, but vf2 is incorrect, with little or no test of kinetic energy conservation. or to two significant figures, the marshmallow would compress by 2.6×10–2 m.
or as expressed in more conventional units to two significant figures, the spring constant is 7.4 (kg·m/s2)·(1/m) = 7.4 N/m. The translational kinetic energy of the mass-spring system will be at a maximum when the velocity v has its greatest magnitude (regardless of direction), which occurs at t = 0.5 s and t = 1.5 s.
[*] Martin Beech, The Pendulum Paradigm: Variations on a Theme and the Measure of Heaven and Earth, BrownWalker Press (2014), p. 42.
or to three significant figures, the length of the pendulum cable is 21.3 m.
If a similar pendulum were constructed in San Luis Obispo, CA, and set into the motion with the same amplitude, it would have a period __________ the period of the pendulum in Portland, OR. which does not depend on the mass, and only on the length L of the cable (which is the same for both locations), and the gravitational acceleration constant g (which is different for these locations). Since San Luis Obispo, CA has a slightly smaller gravitational acceleration constant (9.80844 m/s2) compared to Portland, OR (9.82611 m/s2), then the pendulum in San Luis Obispo, CA will have a slightly longer period compared to Portland, OR. which to three significant figures is 9.26 s, and thus longer than the period of the pendulum in Portland, OR. A D3 piano string[*] has linear mass density of 7.8 g/m, and is stretched with a tension of 626 N. A thicker A0 piano string has a linear mass density of 291 g/m, and is stretched with a greater tension of 1,350 N. The __________ has a faster transverse wave speed. [*] A. Stulov, "Physical Modelling of the Piano String Scale," Applied Acoustics, vol. 69 (2008) pp. 977–984, cs.ioc.ee/~stulov/appl08.pdf. or to two significant figures, 2.8×102 m/s. or to two significant figures, 68 m/s. Thus the D3 piano string has a faster transverse wave speed than the A0 piano string.